We host the Public Service Fair twice a year. 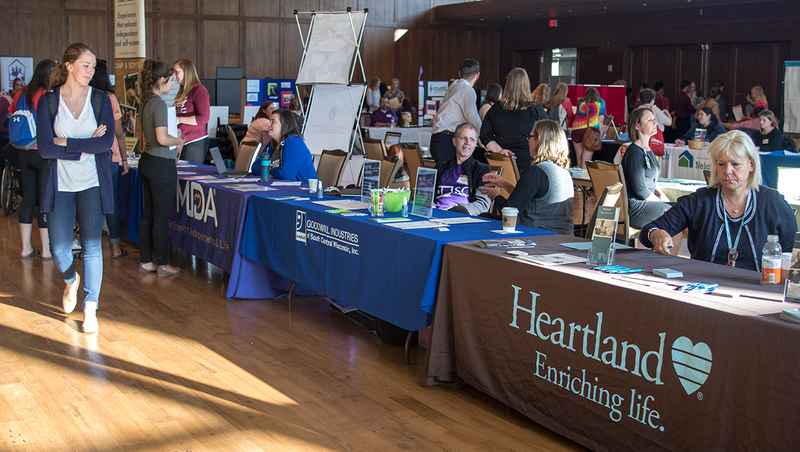 The events provide students the opportunity to connect with local, state and national nonprofit agencies. Students can chat with people from these organizations to find volunteer opportunities, jobs and internships that match their interests, major, and career goals. Click here to see the organizations that will be present at the Spring 2019 Public Service Fair. Sometime before you go to the Public Service Fair, check out the list of organizations that will be there. Pick out a few that you definitely want to check out. Think about what types of service you’re interested in. Hands-on volunteering? Advocacy? Behind the scenes support? Are you looking to volunteer? Looking for an internship? Looking for a job? You can come right away at 3:00 or you can show up at 5:30. Come and go as you please. Bring your student ID. It will make the short check-in process simpler. Don’t worry about dressing up, but you should look presentable. Jeans are fine. You don’t have to stop at every table, and stopping at a table to check it out doesn’t commit you to anything. Take advantage of the chance to talk to a real person! Ask them: What opportunities do they have? What days and times do they need help? Are their opportunities paid or unpaid? Is their organization accessible to you from campus? Click here to learn more about eligibility, registration and cost.